Pompey’s stay at the League Two summit was short-lived as they lost 2-1 at home to Exeter. There was plenty of energy from a Blues side who dominated possession and created a host of chances. But the Grecians left them stunned with a sucker-punch in each half, with first David Wheeler and then Arron Davies getting the goals. And the visitors made sure they ended Pompey’s unbeaten run with some stoic defending to repel the attacking charge. The only bright point for the hosts was a stoppage-time consolation for substitute Gary Roberts. Paul Cook stuck with the same side that went top of the table by beating Bristol Rovers at the weekend. Pompey came roaring out of the blocks and Exeter struggled to deal with their quick counter-attacks in the early stages. The hosts had three good chances to open the scoring in the space of a few seconds in the third minute. Two of them fell to Gareth Evans, with the winger denied first by a Bobby Olejnik save and then a brave Jordan Moore-Taylor block. Skipper Ben Davies sent the ball back into the box, where Jayden Stockley was waiting to head wide of the post. Kyle Bennett was next to go close with a cleanly-struck free-kick from 25 yards that he bent narrowly off target. The Grecians were finding it tough to stifle Pompey’s attacking verve, although their defenders well doing well to fling themselves in front of any balls into the box. That happened on 18 minutes when Bennett broke brilliantly up the pitch and fed Stockley. His low cross was met by Chaplin, but again there was a red-and-white-shirted man to get in the way. Then, from nowhere, the Blues suddenly found themselves behind, as Danny Hollands was caught in possession and Wheeler drove an accurate drive into the bottom corner. The goal seemed to puncture Pompey’s spirit, although the lively Bennett was still tormenting the visitors with his trickery out wide. And he had a shot saved by Olejnik just before the break after Hollands and Conor Chaplin had combined well to tee him up. Pompey were soon on the attack once the second half got underway and Bennett tested Olejnik’s handling with a long-range effort. A stretching Evans was then millimetres from making a connection after Enda Stevens’ cross had been touched on by Stockley. Cook decided to make his first switch on 55 minutes, with Chaplin making way for Matt Tubbs. But it was Exeter who were next to threaten, with Stockley forced to hack clear after Aaron McCarey had kept out Christian Ribeiro’s close-range shot. It was only a brief reprieve for the Blues, however, as despite offside appeals, Holmes delivered a dangerous ball into the box. McCarey got a hand to it, but the ball sat up kindly for Davies to head past the Blues bodies stationed on the line. Pompey now faced an uphill challenge, although they almost reduced the deficit on 65 minutes. Stockley met a precision corner from Bennett, but Danny Butterfield was well-placed on the line to clear the danger. Cook responded with his second switch, as Roberts replaced Evans to try to add a spark to the Blues’ attack. And the Blues continued to apply plenty of pressure, only to see every foray forward or ball into the box repelled by a resolute Grecians back-line. Stevens sent the ball across the face of goal on 85 minutes, but none of his team-mates were able to force it home. Pompey certainly were not prepared to throw in the towel as they kept pumping the ball forward in the closing stages. And a long-range effort from ROBERTS was deflected past Olejnik in stoppage-time to at least give the home support something to cheer. Pompey’s impressive start to the season continued as they took all three points away from Bristol Rovers. Gareth Evans headed home midway through the first half as the Blues dominated the opening part of the game. But the hosts improved after the interval and forced an Aaron McCarey own-goal during a period of pressure. That kicked the visitors back into life, however, and Jayden Stockley – who was not even supposed to be starting – grabbed the winner. Paul Cook made three enforced changes from the side that drew at Oxford the previous week. Loan signing McCarey came straight into the team in place of injured keeper Paul Jones. There were also spaces for Danny Hollands and Adam Barton in midfield, with Nigel Atangana (back) and Michael Doyle (suspended) both out. But another switch had to be made once the sides had been named – with Adam McGurk picking up a knock in the warm-up and being replaced by Stockley. After a slow start to proceedings, it was Pompey who soon started to control possession and trouble their opponents. Their first decent opening arrived on 15 minutes when Evans charged into the box and shot with the outside of his boot, only to be denied by onrushing Rovers keeper Lee Nicholls. Tom Lockyer then had to race across the box and clear the danger when Stockley quickly flicked Evans’ pass on to Conor Chaplin. And it was Chaplin who should have broken the deadlock moments later, with the teenager somehow heading Kyle Bennett’s cross wide from just a couple of yards out. The Blues continued to torment their hosts and their pressure finally paid off on 29 minutes. It was the impressive pairing of Bennett and EVANS who combined to open the scoring, with the latter meeting the former’s cross and guiding a header into the corner. Debutant McCarey had been a virtual bystander for much of the half, but was called into action twice before the interval. First he had to adjust his feet quickly to stop Lee Brown’s deflected cross from sneaking in at the near post. Then he made a smart stop to deny Jermaine Easter after Christian Burgess’ unfortunate slip had gifted an opening to the Rovers striker. It was the visitors who had the final say, however, with a quick counter-attack, but Evans could only divert Chaplin’s pass straight at Nicholls. Pompey had been in almost total control before the break, but the hosts found themselves level early in the second half. They enjoyed a spell of pressure before grabbing the equaliser – although there was a hint of fortune about the goal. The Blues failed to deal with a cross and although Easter’s shot came back off the bar, the ball ricocheted off McCarey and into the net. Pompey were struggling to find any sort of rhythm and they almost fell behind on 56 minutes when Easter’s long-range drive cannoned back off the post. But the hosts then had two penalty appeals from skipper Ben Davies and Chaplin turned down, with referee Jeremy Simpson deciding the latter had dived and brandishing a yellow card. Cook made his first substitution on 68 minutes, with Gary Roberts – who has been suffering with an ankle problem – replacing Chaplin. But it was Bennett who immediately had a chance to restore the Blues’ advantage when he surged down the right and into the box, only to fire wide when a pass to Stockley was arguably the better option. STOCKLEY soon had his chance to score, however, and took it when he poked home a fine Davies cross to end a patient passing move from Pompey. Rovers tried to find another leveller, but the Blues were looking dangerous on the break, with Cook opting to bring on Kal Naismith and Matt Tubbs rather than shut up shop. That attacking mentality almost paid off on 82 minutes when Roberts played a clever pass to Evans, but Nicholls kept out his fierce drive. The hosts tried desperately to get the ball forward in search of a last-gasp point, but Pompey held firm to go top of the League Two table. Pompey have signed goalkeeper Aaron McCarey from Wolves on a one-month emergency loan. Paul Cook has brought in the 23-year-old after Paul Jones (knee) joined Brian Murphy (groin) on the Blues’ injury list. Michael Poke has also had to cut short a spell on loan at Eastleigh after hurting his shoulder. McCarey – a former Republic of Ireland under-21 international – is a graduate of Wolves’ academy, who has made seven senior appearances for the midlands club. He has previously gained first team experience with stints out on loan at Walsall and York. Adam McGurk’s stunning strike saw Pompey fight from behind to preserve their unbeaten league record at Oxford. The forward fired home from long-range after the interval to cancel out Liam Sercombe’s first half opener. But the Blues had to play out the closing stages with only 10 men after captain Michael Doyle was sent off for a second bookable offence. Paul Cook made two changes from the side that beat Barnet at Fratton Park the previous week. With Gary Roberts and Brian Murphy both absent through injury, in came Gareth Evans wide on the right and Paul Jones between the sticks. It was Pompey who made the brighter start, sending a few deliveries into the box for the hosts to deal with. They were enjoying plenty of possession, but the final ball was lacking and Sam Slocombe remained untroubled in the Oxford goal. And United started to grow into the game as the half progressed, finally having the first decent chance on 26 minutes. Doyle was booked for a foul on Sercombe and Jones was quickly off his line to punch clear the resulting free-kick. Pompey’s keeper was in action again moments later, this time preventing Danny Hylton from scoring with an angled close-range drive. The visitors were soon forced into making a substitution, with Conor Chaplin limping off to be replaced by Matt Tubbs. Hylton then saw his shot deflected behind and it was from the resulting corner that Oxford broke the deadlock. Rose swung a dangerous cross into the box and Pompey were unable to properly deal with the delivery, leaving Sercombe in space to lash home the loose ball. The Blues were still not creating much at the other end and a Ben Davies free-kick that curled wide was the closest they came to troubling Slocombe. United were having more joy, however, and Roofe probably should have guided Callum O’Dowda’s cut-back on target. Johnny Mullins then met a Rose free-kick on 43 minutes, but Jones palmed away his header and Pompey were able to hack clear. And Jones came to the rescue again just before the interval, doing well to make himself large and deny Roofe. Cook made a change at the break, with Adam Barton coming on for his first league appearance in place of the below-par Nigel Atangana. Pompey soon had a chance to draw level when they broke quickly up the pitch and Slocombe did well to stop the onrushing Evans from meeting McGurk’s low cross. Evans then hooked the ball into the box and McGurk sent a header looping narrowly over the crossbar. But the Blues’ afternoon was perhaps best summed up on 58 minutes when Kyle Bennett did well to win a corner. Evans placed the ball down to take what was clearly a well-rehearsed effort, only to roll it straight out of play. But suddenly – and without looking particularly threatening – Pompey found themselves level. There did not appear to be much on when McGURK received the ball 30 yards out, but he let fly with a fierce effort that beat Slocombe’s desperate dive and slammed into the net. The goal seemed to give the visitors a massive lift, although Oxford arguably should have restored their advantage on 69 minutes. Mullins met George Baldock’s cross with a firm header, but he could only direct the ball straight at Jones. It was Pompey now looking the more assured side in possession, however, and they forged another good opening on 77 minutes. A patient passing move ended with McGurk cutting the ball back for Bennett, who was unable to force his shot through a sea of bodies. But, with the Blues firmly in control, they were reduced to 10 men after Doyle ended a brisk Oxford break by bringing down Sercombe. Referee Iain Williamson immediately called Pompey’s skipper over and showed him his second yellow card of the afternoon, followed by a red. However, the Blues saw out the final few minutes with relative ease to take a point back home to the south coast. Pompey have completed the signing of Romuald ‘Rommy’ Boco until the end of the season. But the 30-year-old utility man – who is a Benin international – has gone straight out on loan to Havant & Waterlooville for a month. He was most recently at Indian side Bharat, but has been training with the Blues for the past few weeks. Boco has previously played under Blues boss Paul Cook at Sligo, Accrington and Chesterfield and he made 19 appearances for the latter last term. Conor Chaplin and Adam McGurk on target as Pompey fought from behind to beat Barnet. They were slow to get going and some sloppy marking allowed Andy Yiadom to give the Londoners the lead. But Chaplin and McGurk both displayed some clinical finishing either side of the break to turn the game on its head. And the visitors’ misery was compounded when keeper Jamie Stephens was dismissed for two bookable offences. Chaplin then grabbed his second of the afternoon just before the final whistle to complete an enjoyable afternoon for the Blues. Paul Cook made two changes from the side that drew with Accrington the previous week. Chaplin and McGurk both came in for the first league starts of the season, with Gareth Evans dropping to the bench and Jayden Stockley absent after just becoming a parent. There were plenty of familiar faces in the Barnet camp, with former Pompey midfielder Martin Allen naming both Bondz N’Gala and John Akinde in his side. The Bees boss provided an animated performance on the sidelines and received a ticking off from referee Darren England after gesturing for a home player to be booked. But there was not too much happening on the pitch in a half that was full of commitment, but lacking in quality. Matt Clarke had the first decent chance on 20 minutes, but could not guide Gary Roberts’ corner on target. Instead it was the visitors who broke the deadlock soon after, with Yiadom left alone to calmly slot home Mauro Vilhete’s cut-back. Christian Burgess had a chance to equalise when he met a Kyle Bennett free-kick, but Stephens stopped his header on the line and Chaplin then blazed the loose ball over. But the Blues were level on 37 minutes after Barnet failed to deal with a Roberts set-piece that was sent into the box. CHAPLIN did well to pick the ball up and make space to shoot before rifling home a fine finish past a helpless Stephens. Brian Murphy then had to come charging out of his goal just before the break, narrowing the angle for marauding right-back Gavin Hoyte and forcing him to fire wide. Cook made a switch at the break, with Adam Webster replacing Roberts as Pompey switched to a 3-5-2 formation. And the hosts should have forged ahead on 52 minutes when McGurk sent Bennett through on goal, only for the summer signing to blaze high over the bar. But McGURK was much more clinical when he raced onto Webster’s pass moments later and calmly finished past Stephens. The visitors were not happy that the goal was allowed to stand, however, as Bennett – who did not touch the ball – was flagged offside. The advantage might have been extended on 57 minutes, but Webster was unable to divert Ben Davies’ dangerous free-kick on target. Barnet’s task was made a lot harder when they were reduced to 10 men midway through the second half. Stephens came racing off his line to try to beat Bennett to the ball, but only succeeded in clattering into the Pompey midfielder. Having already been booked for time-wasting before the break, England had no choice but to show him his second yellow card, followed by a red. Akinde was sacrificed so teenage keeper Kai McKenzie-Lyle could come on, while Evans replaced Clarke for the hosts. The academy stopper stopped his side from falling further behind on 82 minutes, though, tipping Chaplin’s header over the bar. Substitute Matt Tubbs was then unable to find the target from an acute angle following a poor clearance from McKenzie-Lyle. But it was CHAPLIN who added a gloss to the final score in stoppage-time, when a long Murphy ball was flicked on and he calmly slid the ball home. Pompey’s unbeaten start to the League Two campaign continued, but they had to settle for a point against Accrington. In a game of few clear-cut chances, it was the Blues that created the better openings. Gary Roberts and Matt Tubbs went closest to finding a winner, but both were denied by Stanley keeper Jason Mooney. Paul Cook stuck with the same side that beat Luton in Pompey’s last league outing, meaning Jayden Stockley was preferred to Tubbs up front. But there was no repeat of the electric start at Kenilworth Road, with chances few and far between in a laboured opening. The hosts had a couple of dangerous crosses dealt with, while Brian Murphy was not overly troubled by Piero Mingoia’s glancing header at the other end. Michael Doyle livened things up with an audacious effort from inside his own half on nine minutes, however. The Blues skipper spotted Mooney off his line after the keeper had charged out to clear a long ball, but his shot flew narrowly wide. There was a flurry of bookings midway through the half, two of which came following a scuffle in the middle of the pitch. Referee Brendan Malone took the names of both Ben Davies and Sean McConville, although Pompey’s right-back could feel a little hard done by after being pinned down by his Accrington counterpart. It was Stockley who had the game’s first decent opening on 33 minutes, volleying Kyle Bennett’s corner inches over the top. Gareth Evans then went down in the box under pressure from Seamus Conneely, but Malone waved away his penalty appeals. And Roberts came close to breaking the deadlock seconds before the break, beating his man before stinging Mooney’s fingertips with a fierce drive. There was a surprise at the start of the second half, with Murphy failing to reappear and Paul Jones replacing him between the sticks. And he was called into action on 55 minutes, getting down to his right to push clear a snap-shot from McConville. Pompey, meanwhile, were exhibiting plenty of neat build-up play, only to be let down by the final ball. Cook made a double switch to try to improve their attacking fortunes on 66 minutes, with Stockley and Bennett making way for Tubbs and Conor Chaplin. The latter soon did well to win a corner, which ended with Matt Pearson bravely blocking Doyle’s drive. The hosts were still struggling to break down a resolute Accrington back-line, however, and the visitors went close to scoring themselves on the break, with a long-range effort from Josh Windass that flew narrowly over. Chaplin got the crowd on his feet after shaking off his marker and surging towards goal on 80 minutes, but the teenager was unable to bend his shot past a defender. Tubbs then met Davies’ cross with an acrobatic scissor kick that was flying into the net before Mooney stuck out a hand to palm the ball clear. And Accrington formed a wall of red shirts in the closing stages to keep Pompey at bay and secure a share of the spoils. 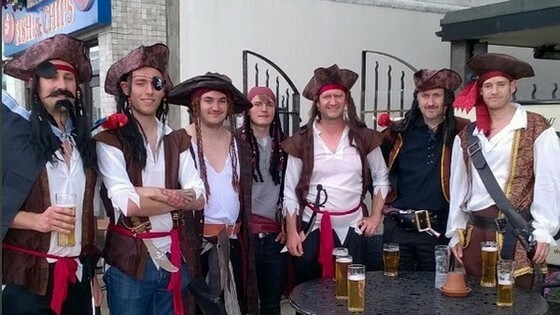 Sam’s birthday – Pirate Day!! A trip to the Isle Of Wight and quite a few drinks required. A fresh-faced Pompey side were knocked out of the Johnstone’s Paint Trophy in the first round at Exeter. The Blues looked bright before the break, with Adam McGurk and Conor Chaplin both coming close to firing them ahead. But Ryan Harley opened the scoring for Exeter from the penalty spot after the interval before Alex Nicholls secured their safe passage into the next stage. Paul Cook handed debuts to three players as he selected a youthful side with only three players aged over 20. One of those was fit-again summer signing Adam Barton, although the midfielder was handed a role in the centre of defence. Academy starlets Calvin Davies and Brandon Joseph-Buadi also made their senior bows, while there were maiden starts for both Adam May and Ben Tollitt. But the inexperienced outfit were unfazed and should have broken the deadlock after just 14 seconds. A defensive error sent McGurk one-on-one with Bobby Olejnik, but the Grecians keeper got down quickly to parry the ball clear. Pompey played with plenty of freedom in the opening stages, with Davies looking particularly keen to get forward down the right. The hosts unsurprisingly started to see more of the ball as the half progressed, but Barton brought one dangerous move to an end, while Danny Butterfield then fired wildly over the bar. David Wheeler did have the ball in the back of the net on 18 minutes, although referee Lee Swabey had long since blown his whistle for a shove on Adam Webster. Alex Nicholls came closest to breaking the deadlock for Exeter with a swerving cross that a back-pedalling Paul Jones just about managed to prevent from dipping into the net. Pompey were creating chances of their own, however, and Chaplin forced another decent stop from Olejnik after latching onto May’s threaded pass. Tollitt then fired over when well-placed to test Olejnik before Craig Woodman made a vital clearance to stop Chaplin converting McGurk’s cross. Then, with the interval approaching, Davies won a free-kick wide on the right and Chaplin stepped up to curl the ball against the bar. It was the hosts who were first to threaten when Manny Oyeleke sent in a low cross that Ryan Harley turned narrowly wide. But the Blues soon started to settle and there were half-chances for Tollitt and McGurk to trouble Exeter. It was the Grecians who broke the deadlock on 54 minutes, however, after Joseph-Buadi brought down Tom McCready in the box. Referee Lee Swabey pointed straight to the spot and Harley stepped up to emphatically slam home the penalty. Cook soon made his first switch, with Kal Naismith becoming the latest debutant in place of Joseph-Buadi. Chances were proving much more difficult to come by in the second half, although skipper Ben Close did have a long-range drive blocked. But Exeter doubled their advantage on 72 minutes when Nicholls’ shot from out wide flew past Jones’ grasp and into the net. Another youngster was then handed his senior bow as Christian Oxlade-Chamberlain replaced McGurk. And Brandon Haunstrup made way on 82 minutes as Kaleem Haitham became the next player off the production line. The young guns were unable to inspire an unlikely comeback, but the travelling fans still seemed pleased with their glimpse of what the future might hold for Pompey.